Step back in time as you visit Jane Austen’s ‘Great House’, owned by her brother Edward, and where she was a regular visitor. During the period 1763­1780, the house’s formal gardens were swept away to be replaced by parkland in the English Landscape style popularised by Lancelot ‘Capability’ Brown. This involved surrounding a house with seemingly natural lawns grazed by animals discreetly held back from the house by a ‘ha­ha’ or ditch that was invisible from a distance. The South Lawn, and the views to and from the house, have been reinstated in this style. garden in her letters, but it wasn’t built until 1818­1822 after her death in 1817.
garden is now entered. Later, the garden was turned into an orchard. Prejudice’ roses, which were bred especially by the Harkness Rose Nursery in 2013 to celebrate the 200th anniversary of the publication of the novel. 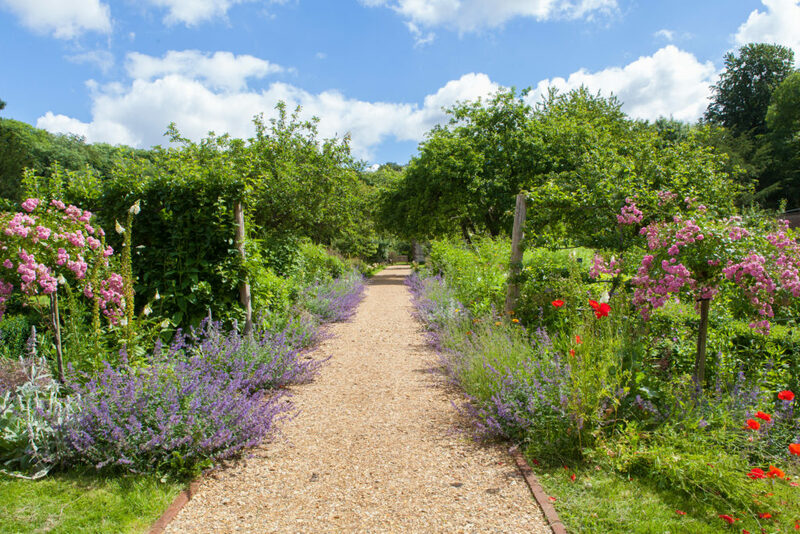 Located in Walled Garden is the Elizabeth Blackwell Herb Garden, inspired by A Curious Herbal, one of many fascinating books in Chawton’s library collection. A guide to different plants and their medical uses, Blackwell undertook this ambitious project to free her husband from debtors’ prison. It was published in 1737-1739 to great acclaim enabling his release.